If you grew up in the 80’s and early 90’s like I did, you might have been a fan of Guns N’ Roses. 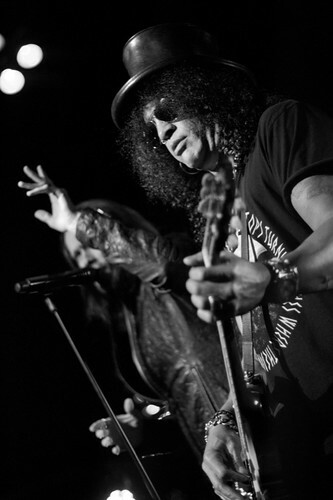 While they’re still around today, they hardly resemble the lineup that featured Slash, Duff McKagan and Izzy Stradlin. The name might be the same but the band now seems to consist of Axl Rose and a group of randoms. Kasabian are a great show band. They show well. They perform well. They look like great rock superstars. And they pretty much rocked down the 9:30 Club Tuesday night in a stellar display of musical muscle, also sounding, not just looking, like space rock deities. Perhaps the most impressive characteristic of Kasabian is that they seamlessly utilize all six of their members. In other cases, I have found more band members to distract from concert performances, but with Kasabian, everything flowed and everyone had a function. 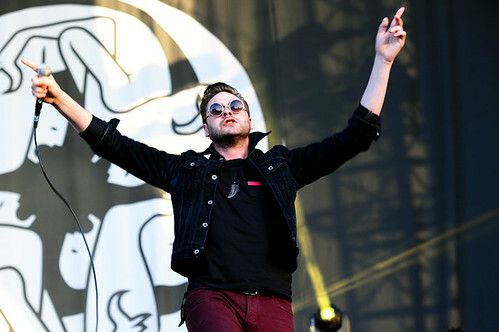 The band made impressively versatile use of its two vocalists — Tom Meighan and Sergio Pizzorno. 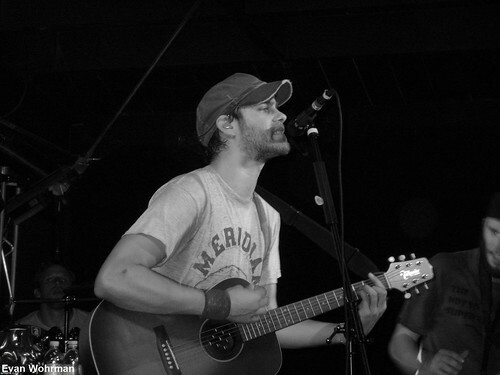 Meighan appeared as an earnest, sincere singer putting his heart and soul on display in songs of lost love and dogged determination. Pizzorno growls and howls a bit more like a long-haired rock icon as he pounds on his guitar. The effect is not dissimilar than watching a young Mick Jagger and Keith Richards team up and trade off. What better way to truly celebrate the spirit of St. Patrick’s Day than to join a céilidh? Since such intimate gatherings are a bit tough to come by here in the DC area, the next best thing would be going to National Geographic and immersing yourself into the music of Moya Brennan. On her last stop of a brief U.S. tour, Moya will be filling the air with her ethereal voice and Irish and Gaelic music tradition. 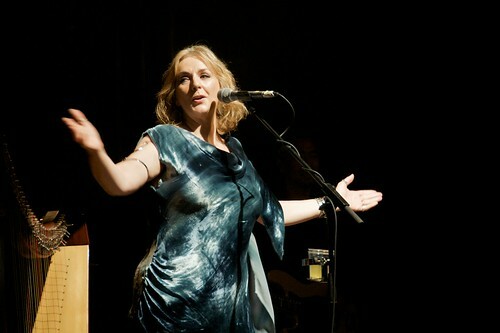 Known best as the front singer for Clannad, Moya’s solo career has flourished over the last two decades. (My wife – herself of strong Irish heritage – and I have been a fan of her music since Moya’s first solo album Máire, which came out in 1992.) Bono of U2 describes her as “one of the greatest voices the human ear has ever experienced.” Her seemingly otherworldly voice mixed with her mastery of Irish and Gaelic musical traditions have made her into a master of taking traditional, cultural music and making it “new” for the modern age. Got plans tonight? 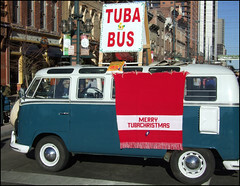 Cancel them, and head over to the Kennedy Center for the 38th anniversary performance of TUBACHRISTMAS. 6pm. A volunteer group of tuba players (edit: and euphonium players. Whatever.) will gather and make a joyful noise unto the Millenium Stage. From past experience I can safely say you can stand or sit pretty much anywhere in the hall for good sound. Are you a Tool fan? How about A Perfect Circle? Well, I hope you skipped your chance to see their front-man Maynard James Keenan on Saturday night. 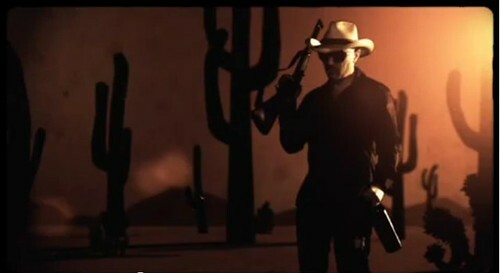 Maynard brought his solo project Puscifer to the Lisner Auditorium for what was supposedly a large production – part multimedia experience, part cabaret. The entire show fell far short of the high bar he set with his other bands. The whole performance wasn’t engaging; the humor seemed to be aimed at 15-year-olds. Maynard describes Puscifer as a “sketchpad of ideas”, which is an apt description of this collection of half-baked thoughts. This is Maynard unfiltered! I actually enjoy some of their music, for those rare moments where I could just rock out and enjoy the songs; but the entire content of the show was a waste of potential. The whole performance struck me as more sarcastic than passionate. Maynard didn’t even seem to be having a good time; it’s like the whole band were just going through the motions of performing. I go to concerts all the time and watch bands desperate to have their voices heard, desperate to connect with the audience somehow. So I found it a bit insulting for Maynard to think that the detritus of his creativity was enough to sell to us at $45 a ticket. 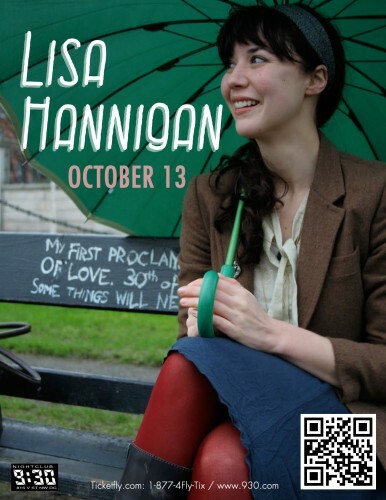 This week we are giving away a pair of tickets to see Lisa Hannigan with Gavin Glass perform at the 9:30 Club on October 13th - yes, THURSDAY this week – at 7pm. For your chance to win these tickets simply leave a comment on this post using a valid email address before 3pm Thursday the 13th. One entry per email address, please. If today doesn’t turn out to be your lucky day, check back here each week for a chance to win tickets to other great concerts. Tickets for this concert are available on Ticketfly. The rules of this giveaway: Comments will be closed at 3pm and a winner will be randomly selected. The winner will be notified by email. The winner must respond to our email in 2 hours or they will forfeit their tickets and we will pick another winner. Tickets will be available to the winner at the 9:30 Club Guest List window one hour before doors open on the night of the concert. The tickets must be claimed with a valid ID. The winner must be old enough to attend the specific concert or must have a parent’s permission to enter if they are under 18 years old. Trans Am & The Psychic Paramount perform at the 9:30 Club on October 7th at 8pm. 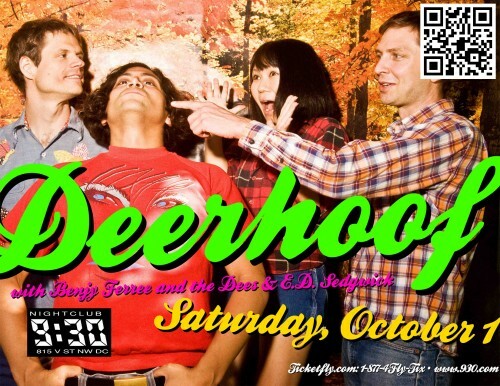 This week we are giving away a pair of tickets to see Deerhoof with Benjy Ferree and the Dees, E.D. Sedgwick perform at the 9:30 Club on October 1st at 7pm. 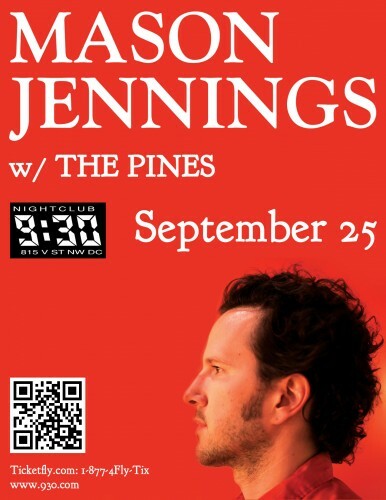 This week we are giving away a pair of tickets to see Mason Jennings and The Pines perform at the 9:30 Club on September 25th at 7pm. 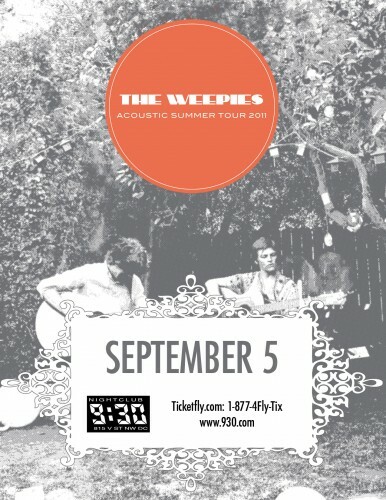 This week we are giving away a pair of tickets to see The Weepies perform at the 9:30 Club on September 5th at 7pm. This smooth indie duo is winding down an acoustic tour across the U.S. with their colorful tunes. Of all the daily deal, flash sale, and flash-local-deal sale sites that have launched in the Washington area lately, none of them can quite match up to Gilt City for sophistication or excitement. While you might expect some of the deals they have offered since their launch in DC – booklets of airline tickets, fancy dining, and high-end spa packages (not the usual half-off spray tan in Fairfax or other “deals” nobody actually wants) – they also really set themselves apart with their organizing of exclusive events or VIP treatment just for Gilt City members. Thievery Corporation and My Morning Jacket have been among the entertainment featured recently, with more curated entertainment experiences yet to come. 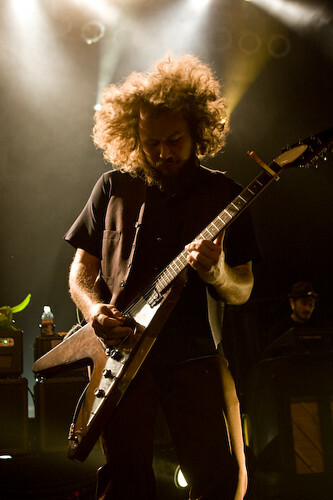 This week we are giving away a pair of tickets to see My Morning Jacket perform at the Merriweather Post Pavilion on August 12th at 5:30pm. Known for the power of their live preformances, this Kentucky sprouted band will roll into DC with the sounds which earned them a grammy nomination. 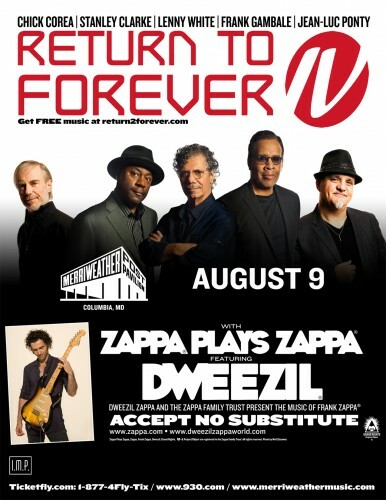 This week we are giving away a pair of tickets to see Return to Forever and Zappa Plays Zappa perform at the Merriweather Post Pavilion on August 9th at 5:30pm. Return to Forever has been redefining jazz fusion ever since frontman Chick Corea’s time playing with jazz Legend Miles Davis. 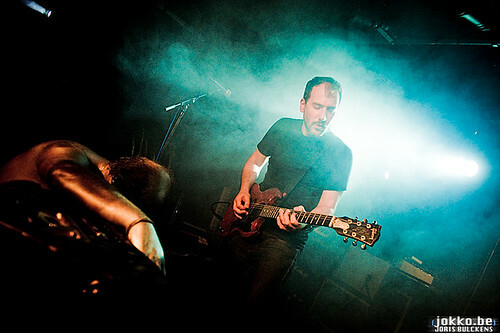 They’re touring with Dweezil Zappa, who is playing the music of his father, the late musical eccentric Frank Zappa. Get your jazz on. 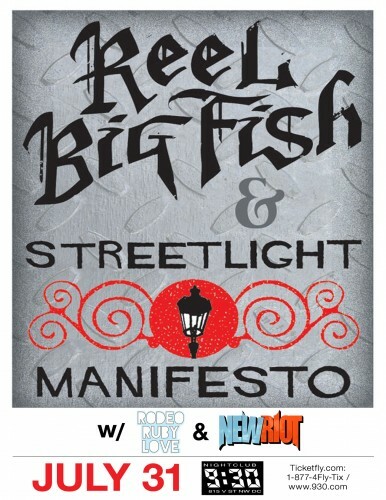 This week we are giving away a pair of tickets to see Reel Big Fish with Streetlight Manifesto and Rodeo Ruby Love with New Riot perform at the 9:30 Club on July 31st at 6:30pm. Holy crap that’s a lot of bands for one night! Ska and punk fans rejoice! 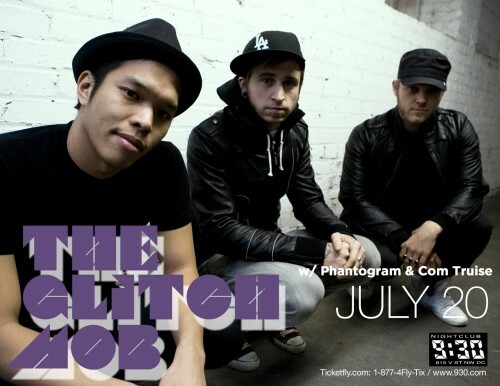 This week we are giving away a pair of tickets to see The Glitch Mob with Phantogram & Com Truise perform at the 9:30 Club on July 20th at 7pm. This dose of digital goodness invades the District on the heels of releasing their new EP, We Can Make the World Stop. The Glitch Mob blends hip-hop and dance into its own flavor of electronic music which has enticed and enchanted audiences at Coachella and Lollapalooza. THE GLITCH MOB : BEYOND MONDAY from BEMO | Brandon Hirzel on Vimeo. For your chance to win these tickets simply leave a comment on this post using a valid email address between 9am and 4pm today. One entry per email address, please. If today doesn’t turn out to be your lucky day, check back here each Wednesday for a chance to win tickets to other great concerts. Tickets for this concert are available on Ticketfly. Comments will be closed at 4pm and a winner will be randomly selected. The winner will be notified by email. The winner must respond to our email in 24 hours or they will forfeit their tickets and we will pick another winner. Tickets will be available to the winner at the 9:30 Club Guest List window one hour before doors open on the night of the concert. The tickets must be claimed with a valid ID. The winner must be old enough to attend the specific concert or must have a parent’s permission to enter if he/she is under 18 years old. The smell of Cocoa Puffs crushed underfoot. Silhouettes of back-hair illuminated by a spotlight. Clouds of sweat puffing around the stage. 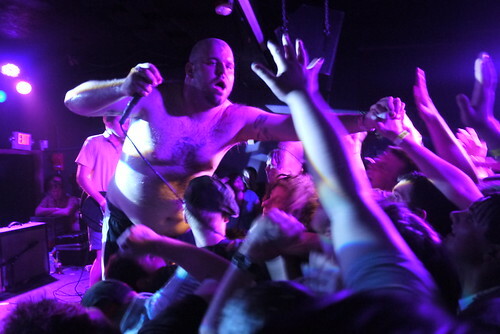 Most of my memories of Fucked Up’s performance on Monday night at the Rock and Roll Hotel aren’t particularly pleasant. But who likes their shows ‘pleasant’ anyway? Yeah, it was kind of a sweaty mess at the front of the stage – a crowd five fans deep, jumping relentlessly up and down throughout the set. But Fucked Up supplied an undeniably, infectiously energetic soundtrack for us to go wild to. Leading by example, Fucked Up’s Damian Abraham rushed on stage and proceeded to rip open a huge bag of store-brand Cocoa Puffs all over the audience. Okay, consider my attention grabbed. Damian was one of those frontmen that’s always doing something to keep your attention, whether he’s spinning his mic around by its cord, leaning into the crowd to yell about the Crusades, or just stomping around on stage. 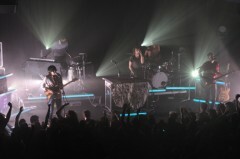 I enjoyed the show from start to finish; I can see why their live shows have gotten them so much buzz. They made the mostly-full Rock and Roll Hotel feel like a summer festival. Zach Condon breezes on stage before the sold-out audience with his shirt-sleeves rolled up and smiles as he takes his spot in the center. To either side of him are the five other musicians who make up the current line-up of Beirut, sharing amongst the six of them about a dozen instruments, but this one-time solo bedroom project remains clearly Condon’s band and he looks comfortable in the starring role. Beirut’s distinctively lush and exotically-influenced style is recreated beautifully live. One notices early in the set that Condon really, truly sings more than the average male indie vocalist – and when he does it is stunning. Presumably honed by years of projecting out over the massive crowds on the European festival circuit, he fills the Black Cat with his voice. 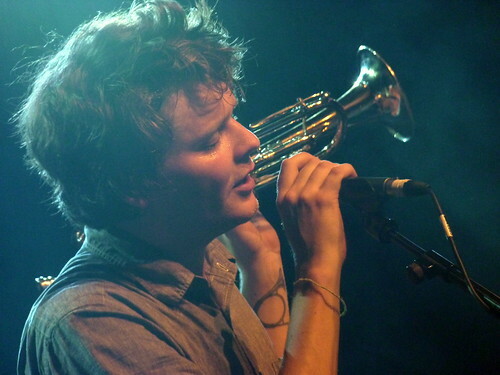 When not singing, he alternates between six-string ukelele and trumpet and, at one point, switched to piano. There is a sophistication to the whole band’s performance that set it apart. There is a trope in concert reviewing to describe musicians as having “raw energy” or “blistering power.” That is not Beirut. Which is by no means to say they lack emotional intensity or seem unenthusiastic about live performance. Instead, the band simply seems rehearsed – not surprising given the time they have spent with the majority of the night’s songs at this point – and genuinely musically proficient and talented. Tomorrow afternoon, the Smithsonian’s National Museum of the American Indian is hosting a free outdoor concert to kick off their yearly Indian Summer Showcase. This year, the Indian Country/Country Indian concert will feature Victoria Blackie (Navajo), Rebecca Miller (Six Nations, Canada), and Becky Hobbs (Cherokee). The concert will take place at 5 pm outside on the Welcome Plaza in front of the museum’s main entrance. I was fortunate enough to squeeze some time from Victoria and Becky to talk about their music, their heritage, and what inspires them in their artistry. First, there’s Victoria Blackie. Last year’s winner of the Debut Artist of the Year at the Native American Music Awards, she also performed at the 2002 Winter Olympics in Salt Lake City, Utah. Her voice has been described as powerful with lots of soul, hearkening back to the days of Patsy Cline, Loretta Lynn, and other female greats of the past. And don’t let her small stature fool you (she’s 5’1”); her voice is strong enough to pull you in and versatile enough to appeal to a wide range of country enthusiasts. Looking for some great things to do over the summer while the tourists flood in? There are several great programs (free!) being hosted by the Smithsonian American Art Museum (SAAM) in Penn Quarter this month. Take some time to check them out! 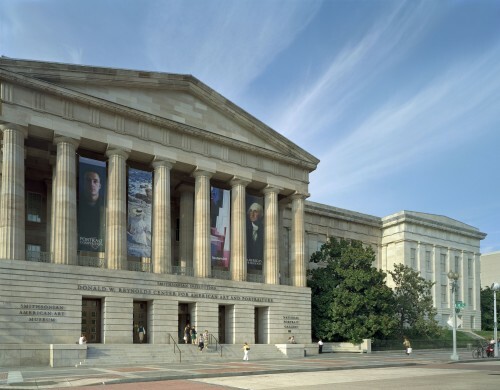 The Smithsonian American Art Museum and National Portrait Gallery host the opening-night film, “Santiago,” of the IV BrazilDocs Documentary Film Week, sponsored by the Cultural Section of the Brazilian Embassy in Washington, DC. In 1992, João Moreira Salles, one of Brazil’s foremost documentary filmmakers, began shooting a film about Santiago, the butler in his childhood home, who had lived a rich and vivid life. Through the film’s personal narrative, Salles addresses the elements of memory and identity that are crucial to the documentary genre.